Class is in session at Rydell High while Grease is the word at Mt. Tabor Playhouse as the Marysburgh Mummers offer the boards to a youth movement over the next two weekends. The venerable Prince Edward County live performance organization based in Milford is presenting the musical Grease over the next two weekends. The music, the dancing, the humour and drama of 1950s teenage love will feature an all-county contingent of budding thespians and, if Tuesday night’s dress rehearsal is any indication, would-be attendees are in for a great performance. 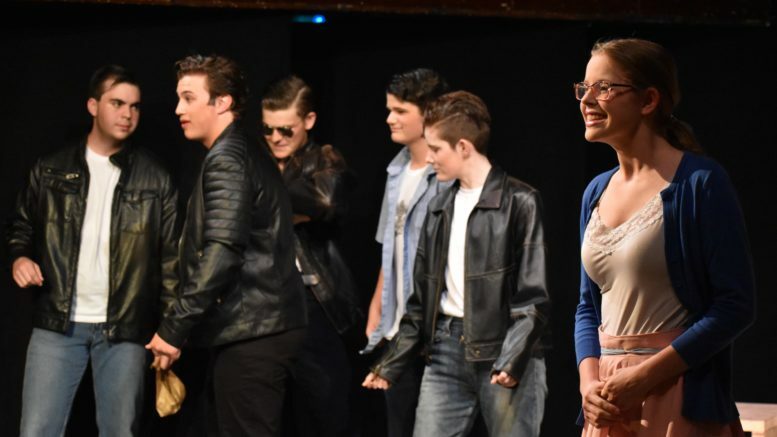 “It’s an all Prince Edward County teen cast and we are so thrilled to be offering Grease this way,” Director and Producer Cathy Peeling told the Gazette. The new chair of the Marysburgh Mummers said getting youth involved in a live performance was something she wanted early in her tenure. The musical romantic comedy that was first produced in 1971 and spawned the film Grease in 1978 seemed like the perfect fit when it was suggested at a Mummers meeting earlier this year. Skylar Pierson stars as Sandy Dumbrowski opposite Jackson Raham who plays the lead of Danny Zuko. Kelli-Anne Maycock, who’ll work with Festival Players of Prince Edward County later this summer in the theatre group’s first Academy for Young Actor Training, supports in the role of Betty Rizzo. The Marysburgh Mummers performance of Grease will take place at Mt. Tabor Playhouse Friday and Saturday nights June 1 and 2 and 8 and 9 at 7 p.m.
Matinee performances will take place Sunday, June 3 and 10 at 2 p.m.